But that’s two weeks from now. Right now is “The Wednesday Incident,” and while it has laughs, maybe has the tears (depending on how much you connect with Marvin), and almost has the revelations, it’s not exactly on the same level as a big event episode. That’s because, unlike “Boyle-Linetti Wedding” (presumably), “The Wednesday Incident” is a filler episode of a season of television that is almost over. Brooklyn Nine-Nine is a show that realizes if you’re going to be a filler episode, you might as well be a good one, and “The Wednesday Incident” does just that. “The Wednesday Incident” (apparently referring to Jake setting off the sprinklers in Holt’s office) is an episode that goes by so quickly that, at first, it’s easy to miss that there’s really not a lot going on. There’s barely even in C-plot in Terry’s need to keep the precinct in order given Holt’s mood, and the B-plot is mostly a few solid jokes that go by just as fast as the episode. It’s very much a more easy breezy episode compared to what Brooklyn Nine-Nine usually does; for all of Brooklyn Nine-Nine’s wackiness, it’s typically a tightly plotted and structured comedy. Plus, at first it appears that the episode is going in a different, more insular direction as the Organized Crime Unit takes over Jake’s case at Holt’s behest. Instead, the A-plot leads to mostly out of precinct shenanigans, which can be pretty hit or miss on Brooklyn Nine-Nine. Luckily, they’re a hit here. Pairing Gina and Jake together is always a delight because of the characters’ and actors’ familiarity and easy chemistry, but it also removes a sense of urgency that tends to come along in the show’s A-plots. Yes, that’s strange to say about a plot that features the two characters going on basically a scavenger hunt to determine why their typically tepid boss is so grouchy (without the reason being “just Jake being Jake”). But when they are discussing the intricacies of a bad Holt impression (that they somehow think is good) or trying to earn the friendship (or at least begrudging respect) of Kevin Cozner, it’s hard to see this as anything other than a lazy day of fun and adventure. 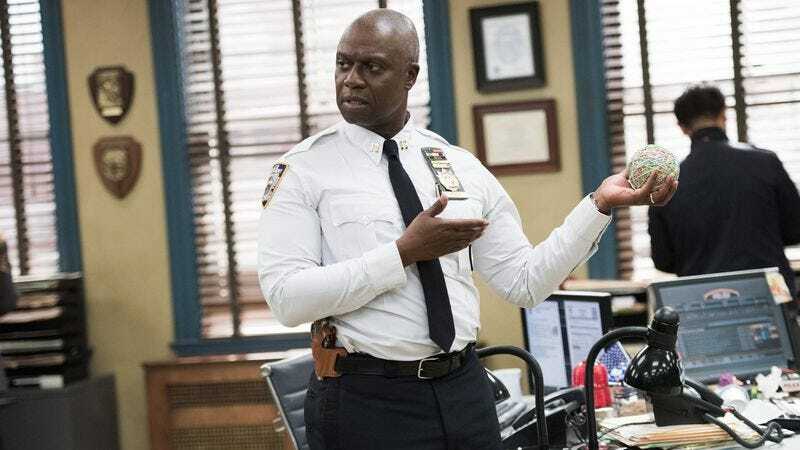 Going “Full Peralta” isn’t an expression like “Full Boyle” was last season, but at a time like this, when the audience sees Jake obsess over something so trivially as to why Captain Holt—a human being—is in a particularly bad mood, maybe it should be. It’s that laser-like Jake focus where he needs to solve something, even if no one else sees something worth solving. His enthusiasm is child-like, yes, but it really is admirable at times to watch Jake be so enthusiastic about certain things that aren’t specifically “cop work” without things getting too chaotic and unprofessional (which was my problem with “Halloween 2”). Never mind that he’s doing this mostly just to prove he’s not the reason for the bad mood. As a result of this being a filler episode and more free-flowing than usual, the characters do a bit more drifting in and out of each other’s plots in a way that they typically haven’t in the the weaker episodes of the season (and the show). The ensemble not being used to its full potential has been a problem for Brooklyn Nine-Nine—a show with a tremendous comedic ensemble—on occasion, but this second half of season two has worked hard to give everyone something funny and/or memorable to do in each episode. In fact, the surprise highlight of the episode is the Boyle plot, which goes away too quickly every time it’s on the screen. The idea of no one taking Marvin (Garry Marshall!) the bank robber (six banks in three weeks!) seriously because he’s a cute old man is ridiculous (though I suppose I can see more sympathetic people feeling that way), but it’s the type of ridiculous that just works in what little time it is given. Even better is incredulous, tail-spinning Boyle who can’t believe how everything is panning out, even though he knows for the fact the old man is a criminal who gives Amy tips with stolen money and memories of his nonexistent granddaughter. The plot is also a Boyle character highlight for focusing more on his role as a cop instead of his role as the weird guy in the precinct (to an extent). Once he admits that his behavior is his trying to remind people that he’s a serious, good cop, it’s a nice wrap-up to a too-short plot. Again, it’s easy to forget that Boyle is good at his job because of how over-the-top absurd he is (in a different way than the Jakes, Amys, Rosas, and Terrys of the precinct) and with his hero worship of Jake (which doesn’t go away in this episode, even with the reminder of Boyle’s capabilities as a cop). But he will not be made a fool of, and that’s pretty damn admirable. Terry doesn’t really have much to do in this episode, but as I mentioned above, he does get to have a dance-off with a robot. That’s really all anyone needs to do in an episode of television. Not only does Boyle have no problem pointing out that Jake’s type is Latina women, he’s thisclose to saying Amy’s name (he gets out a “Sa” and points right at her) before Jake shuts him up. 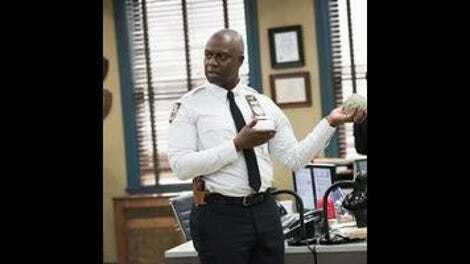 Holt: “Keep your bands in a box or a bag!” Words to live by. Hey, Holt’s fencing instructor is the white-haired man from Revenge (James Morrison)! And actress/writer Katie Dippold is Diane from the diner!